This is a beautiful 1848 full color edition of the S.D.U.K. map of Florida. It covers the state of Florida in its entirety with the westernmost portion depicted in an inset in the bottom left quadrant. The map identifies several Indian villages, forts, lakes, mountains, towns and a host of additional topographical features. The district assigned to the Seminoles is noted along with a 'Passage for small boats across the everglades as reported by the Indians' is here identified. 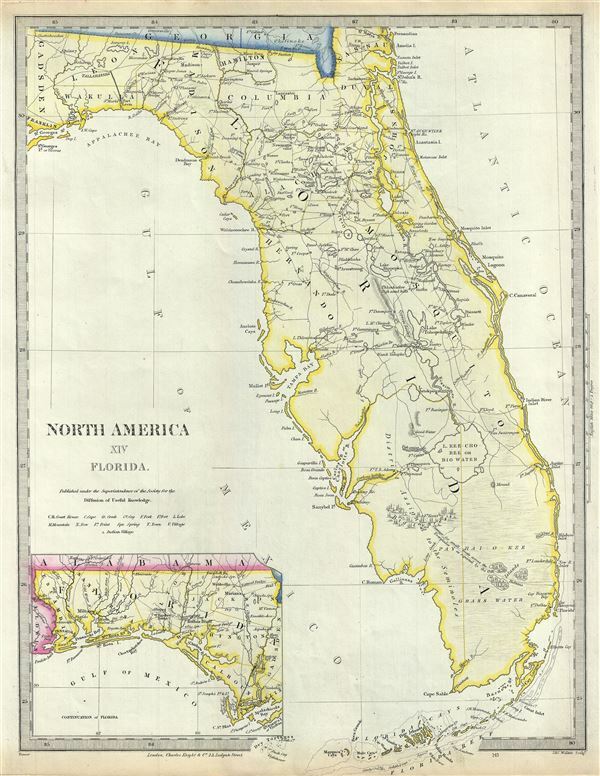 Just a few years after this map was issued, in 1855, Florida would become the seat of the Third Seminole War, the last of the three conflicts between the Seminole Indians and the United States Army. It resulted in most of the Seminole being forcibly removed from Florida, although some remain to this day, staunchly entrenched deep in the everglades. Published in 1848 by Charles Knight of 22 Ludgate Street for the Society for the Diffusion of Useful Knowledge, or S.D.U.K. This was most likely the last edition of the S.D.U.K. atlas to be published before the society formally closed its doors. However, it is known that subsequent reissues of the S.D.U.K. atlas were printed well into the 1870s by Chapman and Hall, who acquired the original plates. Charles Knight (March 15, 1791 - March 9, 1873) was an English map publisher, author, and editor. Knight was born to a known publishing family. His father, a bookseller of Windsor took him as an apprentice. On fulfilling his indenture, Knight proceed to publish several small newspapers, including The Etonian and Knight's Quarterly Magazine. In 1828 Knight has contracted to become the superintendent of the newly formed Society for the Diffusion of Useful Knowledge, or S.K.U.K. for short. Knight's personal values matched those of the S.D.U.K., whose stated purpose was the democratization of knowledge. Most of Knight's cartographic publications were in association with the S.K.U.K., which financed a detailed and comprehensive world atlas. Despite Knights able management, the goals of the S.D.U.K. we're not fiscally supported by the sale of its publication and the organization folded in 1848. Knight however, continued his publishing career as well has his career as an author, producing such works as The Results of Machinery (1831) and Knowledge is Power (1855). He also composed his own autobiography, published in two volumes from 1864 to 1865, entitled Working Life during Half a Century. Knight died in Addlestone, Surrey, in 1873, at a respectable 81 years. Maps of the Society for the Diffusion of Useful Knowledge, (London: Charles Knight) 1848. Rumsey 0890.141 (1834 edition). Phillips (Atlases) 794.